6,358 players started the Main Event of the 2007 World Series of Poker on July 6th. Nine men remained yesterday to play the final table. Truly a worldwide final table, Players with origins in Denmark, Russia, Canada, England, South Africa and the U.S. gathered to play for a first prize of $8.25 million, the most coveted of WSOP bracelets, and a place in poker history. 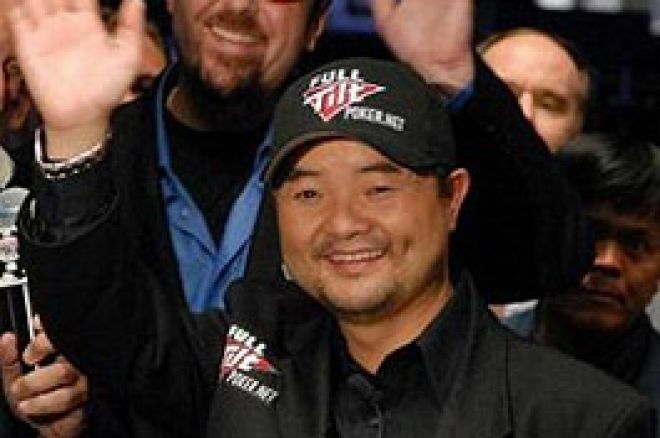 Nearly 16 hours later, after a dominating final table performance that saw him bust all but one of his final table opponents, Jerry Yang from Temecula, CA beat Tuan Lam from Canada to capture the 2007 World Series of Poker Main Event Championship. Yang, who qualified for the Main Event in a live $225 satellite at the Pechanga casino, picked up the bracelet, a Corum watch, and $8.25 million in prize money. Yang promised to donate 10% of his winnings to the Make a Wish Foundation, Feed the Children, and the Ronald McDonald House, joining a long list of poker players who use their winnings to improve their world. Philip Hilm started the day as the chip leader, with Yang well back in the pack, but Yang started off the day very aggressively, taking the chip lead in the first dozen or so hands, then taking on Hilm in hand #15, the first big moment of the day. Yang raised from late position, and Hilm called from the small blind. Yang led out on the flop of , and Hilm called. The turn brought the , and Hilm check-raised all-in when Yang bet out again. After a short time to think, Yang called with for top pair, top kicker. Hilm showed for a pair of fives with a flush draw, and the river brought the . Philip Hilm took only 15 hands to go from chip leader to first bustout of the Main Event Final Table, earning $525,934 for his 9th-place finish. Only 9 hands later, Lee Watkinson fell victim to Yang as he was eliminated in 8th place ($585,699). All the money went in preflop, as Watkinson went all-in from the big blind over the top of Yang's raise from the small blind. Yang asked for a count, and when the officials arrived at almost 10 million in chips, Yang thought for a moment and called. Yang's had Watkinson's dominated. The flop brought the , no help to either player. When the turn brought the , Watkinson could only win with a 7, and the on the river sealed his fate. Watkinson was the only high-profile pro remaining at the final table, ensuring that a new household name would be created when a new champion was crowned. Less than an orbit later, Lee Childs found himself on the receiving end of a Yang beatdown, as he went to the rail in 7th place, earning a $705,229 payday in the process. In another battle of the blinds, Childs raised from the small blind, and called Yang's all-in from the big blind. Childs was in a dominant position as players revealed their cards, with to Yang's , and the flop didn't help either player. The on the turn moved Yang into the lead with two pair, eights and fours, but gave Childs a flush draw to stay alive. None of his outs hit on the river, though, and the sent Lee Childs to the cashier's cage in 7th place for his first WSOP cash. Online superstar Hevad 'Rain' Khan spent the entire tournament hovering around the chip lead and providing entertainment to the railbirds with his almost made-for-tv antics, but he reined in his histrionics on the last two days as the final table neared. Over the course of the Main Event, Khan proved that he was much more than an online guru who can play 30 sit n' go tournaments at once, also showing excellent live poker skills as he marched to his first WSOP final table. The 22-year-old from New York became the 4th player to fall to Jerry Yang at the final table when he was eliminated on hand #56. Yang raised from middle position to 1.5 million and Khan reraised from the small blind to 6 million. Raymond Rahme thought for a few minutes before getting out of the way, and Yang called. Khan pushed his last 3.44 million into the pot in the dark, before the flop came out. The flop brought the , and Yang called, revealing . Khan turned over the , and was looking for one of his outs to improve. The turn and river brought the , and Khan was eliminated in 6th place, for $956,243. Two hands later, Jon Kalmar became the first million-dollar man of the Main Event, as he picked up $1,255,069 for his 5th-place finish. Kalmar also earned the distinction of being the only player on the final table not eliminated by Jerry Yang, as South African Raymond Rahme sent him to the rail. Rahme raised to 2.7 million from late position, and Kalmar pushed all-in from the big blind. Rahme thought for a moment before calling with , a coinflip with Kalmer's . The flop brought the , and Rahme kept the lead with his Jacks. The turn didn't help Kalmer with the , and he had to catch a King or an Ace on the river. The river card was the , and Raymond Rahme sent Jon Kalmer to the rail in 5th place. Kalmar made an incredible comeback at this World Series after losing most of his bankroll in preliminary events. A disheartened Kalmar was ready to fly home to England and skip the Main Event, but the ticket change cost was too high so he decided to play in the last mega-satellite at the Rio. He rode that mega-satellite into the Main Event and all the way to a million-dollar payday at the final table. After a whirlwind first 60 hands where over half the table was eliminated, play slowed considerably as the remaining four player settled in for the long haul. Over 100 hands passed between the elimination of Kalmar in 5th and the elimination of Alex Kravchenko in 4th ($1,852,721). Kravchenko became the first Russian citizen to win a WSOP bracelet when he won Event #9 earlier this summer, and with his final table finish at the Main Event, Kravchenko passed Kiril Gerasimov on the all-time Russian money list. Kravchenko started the final table with the short stack, but doubled up several times over the day to put himself into contention, before running into Jerry Yang on hand #167. Kravchenko raised from the small blind to 2.1 million, and quickly called when Yang pushed all-in from the big blind. Yang found himself in another race, as he held to Kravchenko's . And once again, Yang found himself ahead, when he flopped a set on the flop, leaving Kravchenko only a runner-runner straight draw to stay alive. The turn sealed Alex's fate with the , and Kravchenko was drawing dead. The river was the , and Alex Kravchenko was sent to the rail in 4th, ending a fantastic WSOP for this Russian star. Kravchenko hadn't even finished his paperwork when he was joined in the cashier's cage by Raymond Rahme, eliminated in 3rd place ($3,048,025) by the unstoppable Jerry Yang. Yang raised from the button to 2.6 million, and Rahme re-raised from the big blind to 8.6 million. Yang bet out 10 million on the flop of , and Rahme check-raised him all-in for 27.35 million. Yang thought for several minutes before pushing in the additional 17.35 million. Yang didn't seem happy with the call, until Rahme flipped over , for pocket Kings cracked by Yang's . The turn and river brought the , and Yang sent another victim to the rail. The 62-year-old Rahme became the first person to make the final table of the Main Event from Africa, wishing Nelson Mandela a happy birthday from the final table. Heads-up play between Jerry Yang and Tuan Lam lasted for 35 hands, more than the 2004, 2005, and 2006 Main Events combined. For the record, Greg Raymer, Joe Hachem and Jamie Gold dispatched their opponents in a total of 16 hands. In the final hand, Yang found himself in another coin flip situation, with the to Tuan Lam's . With a nearly 5-1 chip lead, Yang called Lam's all-in re-raise and all the money went in preflop. Lam took the lead on the flop of , and Yang needed an 8 or a runner-runner to win. The turn brought the , and was one of the runners Yang was looking for. When the came on the river, Yang pulled out a miracle last hand to finish off his dominating final table performance and become the 2007 WSOP Main Event Champion. Tuan Lam was eliminated in second place, earning $4,840,981. Yang picked up $8.25 million for his win, a Corum watch, and the most coveted prize in poker, the Main Event bracelet. Yang pledged to donate 10% of his winnings to charity, and said that he wanted to give something back to the community. He thanked his wife, who he said worked very hard, but "does not have to work anymore! ", and said he was going to ensure his six children received the best education. Thank you for joining us at Pokernews throughout the World Series; and come back for best in poker coverage from all the major tournaments throughout the year.